How can you love one project more than the other? It’s getting really tough because I’m in love with this shawl. It’s my first “lacy” type of project, and it turned out just how I had in my mind. 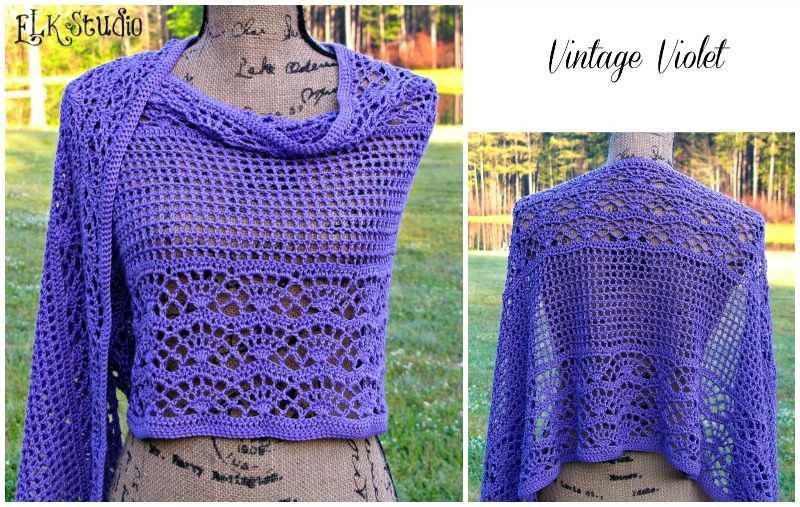 If you know how to use the single crochet and double crochet stitches…..you can make this shawl! The only thing you need is a little time! The measurements of the shawl is 62 1/2″ in length x 17″ in height. Love FREE patterns? Don’t forget to subscribe to the weekly newsletter! Note: The amount should state FREE once you enter the code and click on Apply Code. If it doesn’t, check the steps above. If you click on checkout before it state $0, IT WILL CHARGE YOU! No refunds will be given for accidental purchases. I know sometimes it can be confusing, but just send me a message via my email (elkstudiocrochet@gmail.com), or you can even message me on Facebook! I’m here to help you! Hello everyone! I hope you’ll love my latest pattern called Ocean Splash! The wonderful yarn is Cascade Ultra Pima Cotton! You’ll love the softness and it really has a great shimmer too. The yarn allows for great stitch definition and there are certainly enough different stitches in this pattern to keep you on your toes and interested. If you get bored easily, I think this pattern will definitely hold your attention! I hope you enjoy! Craftsy has the yarn on sale right now! The measurements of the shawl is 60″ in length x 15″ in height. Note: The amount should state FREE once you enter the code and click on Apply Code. If it doesn’t check the steps above. If you click on checkout before it state $0, IT WILL CHARGE YOU! No refunds will be given for accidental purchases. The Hint of Spring beanie pattern is all about trying out a new stitch! Have you ever used the Herringbone double crochet stitch? It’s basically just a different way of double crocheting but the added hint of texture and definition of the stitch is amazing! Plus…the Red Heart soft yarn is wonderful to use for this project because it really allowed each stitch to have its own “look”. I hope you’ll enjoy learning something new! Rounds 21-24: Repeat Round 9, Fasten off and weave in the ends.